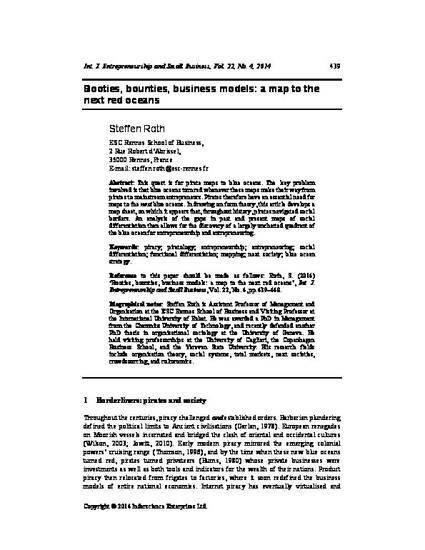 "Booties, bounties, business models: a map to the next red oceans" by Steffen Roth, Dr. This quest is for pirate maps to blue oceans. The key problem involved is that blue oceans turn red whenever these maps make their way from pirates to mainstream entrepreneurs. Pirates therefore have an essential need for maps to the next blue oceans. In drawing on form theory, this article develops a map sheet, on which it appears that, throughout history, pirates navigated social borders. An analysis of the gaps in past and present maps of social differentiation then allows for the discovery of a largely uncharted quadrant of the blue ocean for entrepreneurship and entrepreneuring.